When the #1115 Talking Barbie arrived, it marked another milestone for Mattel. Now their beauties could speak in English or Spanish (stock #8348). They talked about dates, fashion, parties, prom, and shopping. 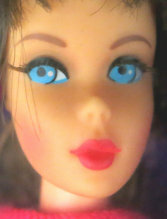 They had blue eyes, various lip colors, and were available with blonde, red, brown, or brunette hair. They changed their hair style two times between 1968 and 1971. 1968 and 1969 she had a side swipe twisted ponytail. In 1970 and 1971 her hair was parted on the side with three split curls and some curls in the back. Late in 1969 she had the side ponytail, but wore the new swimsuit that the 1970 dolls wore. 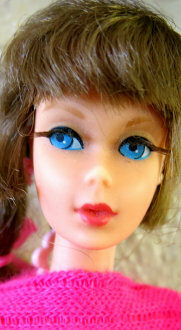 In 1970 a big variation, Mattel used a Stacey Head Mold for some of their 1970 Talking Barbies, and others retained the original mold. 1971 she had center glace eyes. 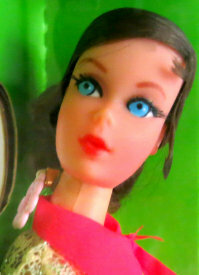 The dolls are marked: (c) 1967 Mattel, Inc. U.S. & Foreign Pats.Pend. Mexico (late 1970-1972 marked Hong King instead of Mexico). The packaging included the doll, her swim-suit, X stand, and booklet. Talking Barbies are the first dolls with divided fingers. The early dolls spoke about Stacey in their speaking; the later dolls spoke of P.J. instead. The Talking Barbie dolls are often found with their arms and legs very loose and falling off. I love being a fashion model. What should I wear to the prom? Let’s have a costume party! Stacey and I are having a tea. #8348 is the Spanish version of Talking Barbie. She is exactly the same as the English version doll.